There are a million and one recipes on the internet for eggnog, so believe me when I say that I'm under no illusions that what I share here is going to revolutionize the eggnog industry. 🙂 It has, however, revolutionized my family! After one little taste, they are hooked. I let the kids taste the leftovers in the Vita-Mix while I was taking pictures, but they had to wait for the rest. I know they're going to ask for this every day. I suppose that will be possible when we have our own chickens and therefore, more eggs to go round. I first got the idea to make eggnog from Annette at Sustainable Eats, who said to follow the Nourishing Traditions recipe for vanilla ice cream, but omit the arrowroot. Then I looked on the internet for raw eggnog recipes. Except for the recipes that call for beating egg whites and incorporating their fluff (too much trouble and raw egg whites are not good for you), or the recipes that call for liquor, I think most recipes are variations on a theme. Meaning: flexible to your tastes! Here's what I put in our first eggnog, which I chilled until it was time to drink it alongside pumpkin pie. Blend milk, eggs, honey and vanilla in blender until smooth. Let the foam settle or not, depending on your preference. Chill or not, depending on your preference. Sprinkle nutmeg atop each glass. Enjoy! When we first started on our Real Foods adventure, my resistant teenaged son would ask for eggnog for breakfast. Of course, he meant the kind in the can, but I had other plans. Heh heh. I made eggnog just like yours, but substituted maple syrup for the honey. I also put in a couple tablespoons of whey and let it sit on the counter during the day to ferment just a touch. At night I’d refrigerate it and it would be ready to drink cold or warm for breakfast. The whey adds a lot of nutrition and the fermentation process takes out a little of the sweetness, leaving a subtle sweetness that’s not quite so shocking first thing in the morning! .-= Peggy´s last blog post… Sponsored Blogging vs. Blogging with Integrity =-. Rebecca – we also don’t have chickens yet. Hope you like it with goat’s milk. As you know, that’s how I did ours. Peggy – I’m going to try that! Thanks for sharing it! The farm near our old house where we used to buy our cow’s milk made the best eggnog. I’ll have to try this with goat’s milk sometime. Too bad we didn’t get chickens this year like we were planning. I’m so excited to make some with the raw cow’s milk we just started buying. My little girl loves eggnog but could never drink more than a few sips without hurting. She can drink the raw milk. Christie – That’s awesome! Yay! Hope you enjoy this! One of the reasons I want a cow (in addition to our goats) is because the cream rises to the top – I bet you could make some awesome eggnog with half cream and half raw whole milk! I’d better get in the kitchen so this can be the girl’s after school snack. They love eggnog but have only had the store carton kind. .-= Millie´s last blog post… Tuesday Twister November 16 =-. I’m back from the kitchen and I have to report on the eggnog. Like any good mom I sampled it- DELICIOUS! I used sucanat instead of honey so my little guy can have some too. Wardee, it is the best eggnog I’ve ever tasted. I used raw cows milk with the cream stirred in. Perfectly creamy. We are making a lot of homemade eggnog these days. Now with a reliable source of Raw Cows Milk and 2 sources for fresh farm eggs from folks that don’t wash the coating off the eggs we feel safe using their eggs raw. I have been following a very basic old recipe from a copy of “Woman’s Home Companion Cook Book” 1951 edition. 2 eggs / 1-2 tblsp. sugar ( we use honey ) / 2 cups milk / 1/2 tsp. vanilla. I mix it all in the blender or a hand beater. I also go a step farther in making this for variety – adding fruits to it like a banana, or pears, apples, etc.. Often toss in about 1/2 cup of frozen wild blackberries. 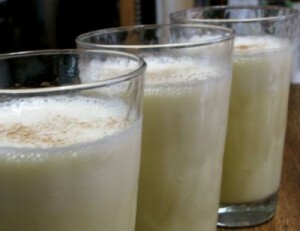 Eggnog has become the main breakfast for my husband daily under doctors orders to drink a glass every day of homemade! .-= Pamela @ Seeds of Nutrition´s last blog post… Allergen Thanksgiving Menu Planner Giveaway! =-. My husband LOVES eggnog. His birthday is next Wednesday and I planned on making some as a surprise for him. I think I’ll try your recipe as the one I usually use, you have to cook it. Of course, that was when I was using store eggs and now I have country eggs. Thanks! .-= Paula´s last blog post… Old Glory =-. YUM I love egg nog. I’m going to make your recipe! I like to add Bourbon and heavy cream to mine as well. It says he used half-cream and half-milk. I think the freshly grated nutmeg also puts it over the top. I used to use ground nutmeg but ever since I bought some whole nutmegs & a nutmeg grinder, it really is a world of difference. .-= Ann Marie @ CHEESESLAVE´s last blog post… Real Food Wednesday: November 18, 2009 =-. Pamela – Funny (a good funny) that your husband has to drink eggnog on doctor’s orders! You’ve got a great doctor! Paula – Enjoy! Its great that you’ve got farm fresh eggs now – are you raising hens yourself or did you find a local source? We’re anxious to start raising hens; hopefully in the spring. We actually found some old people who live near us that have pasture hens. We stopped one day to see if they sold surplus and they do! Amazing price too, 2.00/dozen….ssshhhh, don’t tell anyone, otherwise, we’ll never get any eggs! .-= Paula´s last blog post… =-. Paula – That’s great! What a deal. I won’t tell. We tried a nog recipe a few days ago & it was alright. We do raise our own chickens, so I trust my supplier (LOLOL). I am going to try this tomorrow. .-= Michaela´s last blog post… Menu 11/29-12/5 =-. Hi,Wardee! I tried this recipe yesterday and LOVED it! I whisked in some whipped cream at the end and that gave it a wonderful creamy, fluffy consistency. I also sweetened mine with stevia. Wardee, my oldest son is asking for egg nog. I want to try this recipe. One question – what is the consistency? I have a feeling that he won’t be throughly impressed unless it’s thick like the store bought kind. Tara, I’d do at least half cream to make it thick. Perhaps even 3 cups cream and 1 cup milk. How thick is your cream? Use that to decide whether it will work for him. If the cream is thinner than store-bought eggnog from the get-go, he might not be satisfied. If the cream is thicker than he wants for eggnog, you know you have room to play with adding some milk to the combination. Oh, do let me know! The egg yolks will do some thickening too. This is really good; I hope he likes it. We get our eggs from two sources, the same farmer that we trust our raw milk with, and a friend, whose chickens run all over their farm, but the feed they use is not organic. the Yolks of both are bright orange and beautiful. How Do you feel about eating raw eggs during pregnancy? Katie — I feel fine about it, personally. If you’re going to eat many, raw yolks offer no concerns (other than if they came from a factory farm). However, lots of raw whites can lead to a biotin deficiency, according to some sources (like this: http://www.westonaprice.org/childrens-health/eat-eggs-and-have-chicken-too — near the end). mmm, making this today. Was not able to get raw milk as the store was out. ( yay for Organic Pasture’s problems finally being sorted out!!) . Will be sweetening with stevia and I love the idea of adding whey and fermenting. will try that with some. Thanks for the great recipe! I substitute Stevia for the sugar since I’m on the Paleo diet (ok more like some combination of Paleo/WAPF cuz I include dairy). Do you have any suggestions for what to do with the egg whites? OH MY GOSH! This is sooooooooo gooooooood!! And I have always hated eggnog! Thank you!! I am a bit hooked actually and have made it several evenings in a row. Also tried the adding a banana thing and that was awesome too! Y.U.M.M.Y!!!! Super yummy!!!! We’ve made this three times this week! Definitely gonna make this for my family this weekend! Yum!! I hate eggs & can not bring myself to drink raw eggs. Does anybody have an eggnog recipe without the main ingredient, eggs? I know it sounds crazy, but years ago I did try some eggnog & liked it. Just wondering if it was possible to get the eggnog taste without actually using eggs. I shared this recipe on my facebook page as I love to promote healthier foods. Can you share some good uses for the left over egg whites? So I made this with coconut milk for my family and it was a hit!! But, question. I’d like to make it for a party we are having. And although I have zero problem with drinking raw milk and eating raw eggs for my family, I also believe that is a personal decision and don’t want to force it on my guests. And our gut flora is used to this and theirs probably is not so… I got some really good non-homogenized, organic, vat pastuerized milk to make this with. But do you think I could blend it and then just heat it slightly to be sure the eggs are safe by their standards? I could do that with raw milk too I guess!! Let me know your thoughts. I know there are cooked eggnog recipes out there but they seem way complicated and I don’t understand why they have to have so many more steps than blend, heat slightly and cool! Perhaps someone here has tried! Thanks much! Could I make this into ice cream? Or would it not work because you would have to heat it up? As long as you’re using pastured eggs as mentioned in the recipe we think this would make an excellent ice cream. However, if you need to use eggs other than pastured you should heat the mixture first, let cool, then make the ice cream. Let us know how it turns out if you try it! Making the ice cream right now. I ran out of fresh nutmeg so I had to do pumpkin spice. Another question. How long can the Eggnog last after it’s been made? Freshly made eggnog usually doesn’t last in our household, it is consumed within that day or the next 🙂 I would say store it in an airtight container no more than 2-3 days.